Summary: Your Thanksgiving feast carryovers could be death in a Tupperware container! Station: WPXI Channel 11 Reporter: Darieth Chisolm When It Aired: Nov. 24 Running Time: 23 seconds Visuals: * Views from outside a HoneyBaked store. Highlights: * When anchor Darieth Chisolm touts this as one of the lead stories on the 11 o'clock news: "Leftover danger. What you need to check your refrigerator for." * When she announces the news we've been worried about and dying to hear: "A recall that may impact your Thanksgiving leftovers. HoneyBaked Foods Incorporated is recalling about 47,000 pounds of turkey and glazed ham. The company says the products could be contaminated with a potentially dangerous micro-organism. It could be fatal to those with weakened immune systems." * When Chisolm adds, "The products were sold through the company's catalog and Internet between September 5 and November 13." What We Learned: Next Thanksgiving, make it SPAM. Unanswered Question: According to a statement that appears on the company's Web site, "Customers can receive a full refund, and HoneyBaked Foods will make arrangements to pick up any unused portion of the product." Does this include corpse pick-up and funeral arrangements as well? (Though you'll be relieved to know there are no reports of anyone dying so far.) News Value: 4. We're hearing about food that can purportedly kill us, a day after we may have eaten it for Thanksgiving dinner? It's kind of like the old joke that goes, "The doctor called, and he has bad news and really bad news. The bad news is, you have 24 hours to live. The really bad news is, he was supposed to call you yesterday." Summary: Two Baldwin residents named Bob battle it out for bragging rights over who has the more over-the-top home holiday light display. 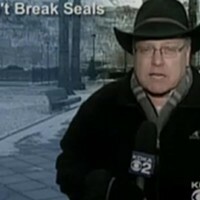 Station: WTAE Channel 4 Reporters: Shannon Perrine, Jake Ploeger When It Aired: Nov. 26 Running Time: 1 minute, 7 seconds Visuals: * Bob Cox, who WTAE identifies as "The Other Light Man," at night, standing proudly in front of his blinding handiwork. Highlights: * When anchor Jake Ploeger teases, "The battle brewing in Baldwin: two homes, two guys named Bob, and more than 100,000 Christmas lights." * When Ploeger says, "Two guys takin' Christmas lights to the next level." * When Perrine reminds us of WTAE's story the previous evening, in which they featured the first Bob, who boasts of more than 35,000 lights in his display, and announces, "Tonight, meet the other light man ... Bob Cox lives just a few blocks [from the first Bob]. He says his house is decorated with 72,000 Christmas lights. The display features inflatables, as well as animations, all synchronized to music ... an FM transmitter allows passers-by to tune in on their car radios." * When Perrine ends, "Both Bobs are in it for fun and to help local charities." What We Learned: This is one instance when "keeping up with the Joneses" is a good thing. Unanswered Question: How many times do you think the Bobs have seen the movie, Christmas Vacation? News Value: 72,000 lights. I can't help it -- I'm a sucker for men who are passionate about their work.